Micromanagement is defined as “a style of management whereby a manager closely monitors and controls the work of their subordinates and/or employees.” Though a great manager should, of course, be knowledgable about the infrastructure and dynamics of their team, it is imperative that they not patronize and/or demotivate their workers by constantly hovering. Micromanagement often causes feelings of scrutiny which can lead to frustration, burnout, lack of productivity, and can ultimately result in high employee turnover. While there are some instances when micromanagement is a productive tactic, (like onboarding new employees), and some circumstances when it is absolutely necessary (like in a crisis) — overall, micromanagement is perceived as having a negative connotation and ineffectual impact on employees. 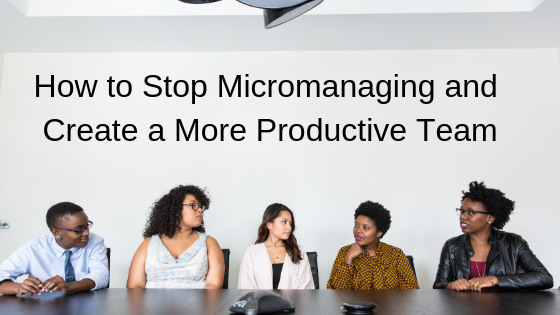 The following are five things to consider about micromanagement and the best ways to avoid it, so you can create a more productive, functional team and more enjoyable, trusting work environment. If your boss is not able to trust you, or if you are not able to trust your boss, a constant battle of control and oversight is likely to occur. Additionally, no trust within a working relationship can lead to poor morale and a lack of autonomy — meaning, if an employee assumes their work is just going to be re-checked, criticized, and redone, they may not bother to put much in effort in the first place. Building trust creates a sense of faith and capability for workers. Managers who exhibit trust in their employees’ work will encourage motivation and independence; subordinates who are able to trust their supervisors are able to feel more confident and supported. Relinquishing control is very hard to do, both in business and in life, but it is necessary. While you might have a preconceived vision of how you foresee a project completed or task performed, try to remember that there is more than one way to accomplish a goal. Also, it may be helpful to keep in mind that there is more than one employee for a reason — it is unlikely that you would be able to perform all tasks by yourself — so utilize your team members! When practicing delegation, it can be useful to identify (and then play to) people’s strengths, as opposed to focusing on their weaknesses and therefore refusing to delegate work to them. For example, you might feel more confident delegating a project that is time-sensitive to someone you know works well under pressure. Let’s be honest, no one wants to think of themselves as a micromanager. Similarly, no one wants to think of themselves as sensitive or easily agitated. However, micromanagement stands to breed contempt as workers on both sides identify leadership styles, personality traits and job roles/responsibilities among one another. Always be willing to have a conversation if you are feeling untrusting, untrusted, annoyed, resentful or frustrated. Keep communication as a priority and try to establish that openness and feedback are encouraged. Also, try not to place blame on one another, or deny perception but rather, work to establish methods that most effectively get the job done. Allow others to make decisions and encourage them to ask questions — not just about projects and tasks but internal processes as well. Use information and insight from others to identify some best practices and what simply doesn’t work within your team. It might be hard to hear, but welcome feedback about your work, your leadership style and any areas of improvement as perceived by your co-workers. Additionally, do not hesitate to offer feedback as well, particularly if you find yourself feeling resentful of frustrated as a result of micromanagement. Feeling heard is a very powerful tool in a working environment. Asking for input allows practice in the areas of communication and trust and can hopefully help you be aware of things you may otherwise not have. Go higher, think bigger. A good way to avoid micromanagement is to keep the “big picture” in mind. As a manager, the less time you spend overseeing and correcting the work of your subordinates, the more time you have to spend at a higher level on strategy. As a worker, the more time you are able to give to understanding the common goal you are working towards, the less susceptible you are to succumb to feelings of resentment and annoyance. Don’t assume that without constant intervention, people will fail. Instead, clearly set goals and work toward them: together.